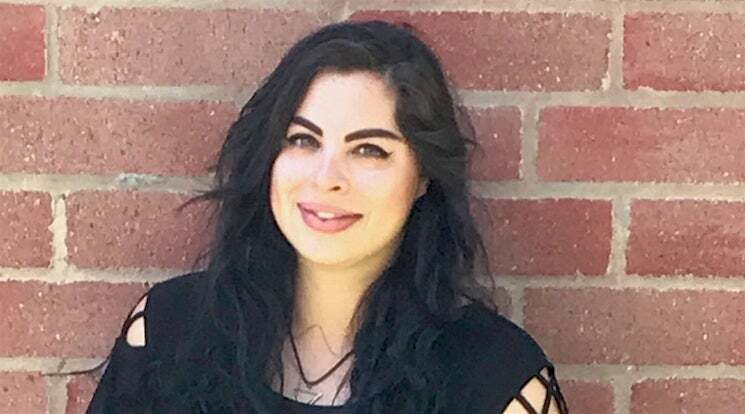 Given her childhood fascination with the movie Armageddon, about a gigantic asteroid on a collision course with Earth, it’s not surprising that School of Earth and Space Exploration recent grad, Alexandra Perez, focused her studies here at ASU on meteorites. Since beginning her master’s degree at ASU in geological sciences, Perez has conducted over 130 experiments to determine how chondrules (a mineral grain present in some stony meteorites) form. Research on these primitive specimens may help us better understand the evolution of the early solar system. Given her interest in meteorites, It’s not surprising that Perez’ favorite spot on campus was the second floor of the Interdisciplinary Science and Technology Building, where the Center for Meteorite Studies is located. ASU has the largest collection of meteorites of any university (over 40,000 specimens) and a variety of meteorites are on display here, both behind glass, as well as some that you can touch. When asked the best piece of advice she’d give to those starting college, Perez recommends students push themselves beyond their limits and comfort zones. “This is the only way you can find what you are capable of and you will surprise yourself along the way,” she says. And she practices what she preaches. Alexandra has been described by her advisors and instructors as both positive and persistent. She has also overcome tremendous challenges, including surviving a brain tumor prior to starting her degree. Her plans after graduation include a trip to New Zealand and Australia, as well as spending time with family. After a break, she plans on pursuing a Ph.D. and continuing to raise awareness of brain tumors and supporting the search for a cure.